Bring the world alive by handing out these newspaper clippings to your PCs at various intervals. 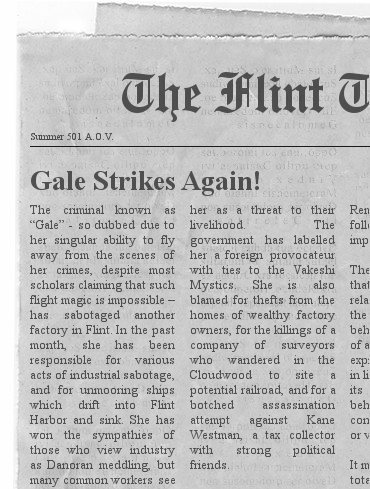 Whether they see them in the offices of the RHC, in a first-class cabin on the Avery Railroad, or being sold on the streets of Flint, these clippings will help keep your players immersed in the events of the world. These clippings are the same news items found in the “Meanwhile in the News” sidebars in each adventure. Simply print them out, and distribute them as and when you feel like it. There’s a sample to the right, but you can grab the whole lot (divided by adventure so you don’t get them mixed up) in the ZIP file above. The ZIP file contains 25 newspaper clippings in total. We created these using the free online Newspaper Snippet Generator – so feel free to make more of your own and share them so other ZEITGEIST GMs can enjoy them (put them in the EN Publishing forum, as you won’t be able to upload attachments here). They only take a few seconds each! This is a bonus ZIP file containing 40 NPC portraits. These are the same portraits from the ZEITGEIST adventure path itself presented separately as JPEG image files for convenience. You can use them for ZEITGEIST or for your own campaigns. Note that these are for personal use only, and are NOT publisher clip-art. The second portrait package contains 25 portraits of NPCs from adventures 4-6. If you like the theme tune in the trailer, you can grab it here in .mp3 format. You can use this for personal use. You may not distribute it or use it for commercial use. E.N. Publishing’s naval supplement Admiral o’ the High Seas has a full set of rules for adventures at sea, but herein we present enough rules to handle basic naval combat between two ships. If your group particularly likes ship encounters, your GM can use the additional material in Admiral o’ the High Seas to spice up nautical engagements. For Pathfinder and D&D 4E. Download at EN World.